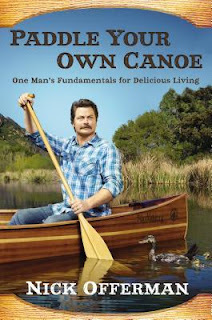 Paddle Your Own Canoe: One Man's Fundamentals for Delicious Living by Nick Offerman is the autobiography of, well, Nick Offerman. 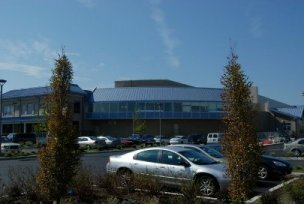 Most recently known for his portrayal of Ron Swanson on the TV sitcom Parks and Recreation. Lately I have been on a biography kick, and this seemed like the next logical one to read. In this memoir, Offerman offers the reader a close-up look at his personal history and life leading up to his decision to transition between the theatre and the screen, and his choices that led him to make the move from Chicago to Hollywood, break into television, and pursue a relationship with the woman who would later agree to be his wife. It is by no means a memoir for the faint of heart: containing lewd humor, course language, and blunt honesty. But in addition to this, Offerman doles out life advice, romantic tips, and hysterical poetry that remind the reader that the stoic and straight-faced Ron Swanson character that catapulted Offerman into the public eye was the result of a brilliant and versatile actor, capable of captivating an audience on screen, and now on paper. This has been on my list to read for a while now, especially after having read Amy Poehler's memoir, Yes, Please. I finally pulled it off my shelf after burning my way through the giant stack of YouTuber memoirs that have been occupying all of my time. Offerman definitely is a multi-talented individual, capturing audience's attention through a variety of mediums and I can't wait to read his next book, Gumption: Relighting the Torch of Freedom with America's Gutsiest Troublemakers. Paddle Your Own Canoe: One Man's Fundamentals for Delicious Living, is available to borrow from the Ocean City Free Public Library.